“Frustrated by the promiscuous use of the accusation of “corruption” to cover all sins, in recent days some scholars of contemporary South African politics have offered alternative framings. Indeed, it is helpful to look beyond the details of venality, and identify some deeper patterns. But there is a risk that the result could be to inadvertently and wrongly take the edge off a sense of urgency. At this moment of crisis, there are two mis-framings in particular that potentially have pernicious consequences. The first is an over-eagerness to describe any and all shortfalls vis-à-vis “good governance” in binary terms – as “proof” that a rule-bounded polity and economy has been entirely overtaken by patronage. The second is a conflation of the distinction between patronage and predatory kleptocracy. Both end up, inadvertently, downplaying the magnitude of what is at stake. It’s time to look to the rest of the [African] continent for evidence on how the crisis within the country’s ruling African National Congress (ANC) is likely to unfold. 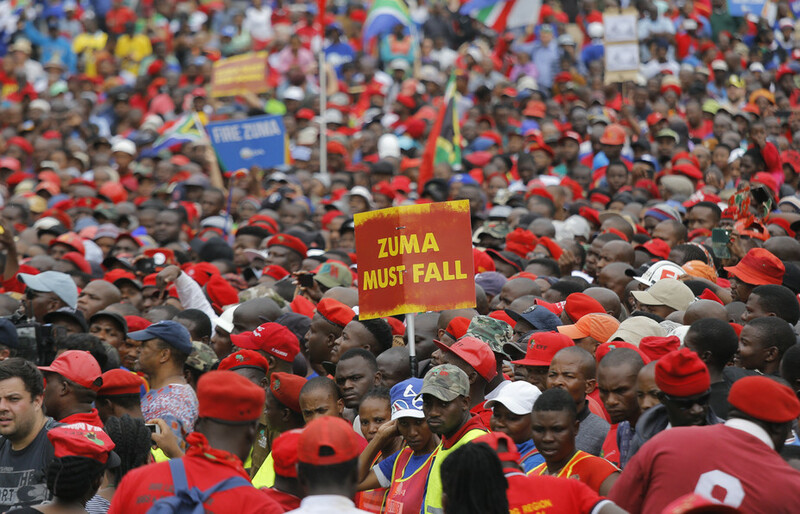 Putting this process in its historical context is important: it makes it clear that while Zuma has been a disaster, it would be naïve to think that he is the sole source of the ANC’s problems – or that his removal will solve them. It also shows that South Africa is not exceptional, and instead faces similar problems to many other countries on the continent. One small silver lining to this cloud is that we can use the experience of other states to better understand the prospects for South Africa. One thing we know from Kenya and Nigeria is that the kind of politics practised by the president quickly embeds clientelism within key parts of the government and bureaucracy. A binary framing of the tension between rule-boundedness and patronage along the above lines underplays the differences between the patterns of governance in low-, middle- and high-income settings. It also underrates the ways in which these differences are aligned with systematic differences in the ways in which polities and economies function. Measured in purchasing power parity, South Africa’s current per capita income is four times that of Kenya. It is twice that of Nigeria, and similar to that of middle income Brazil and Thailand. Also worth noting is that it is less than one quarter that of Australia or the United States. These differences in income are mirrored in the most robust available estimates of variations in the quality of governance. South Africa’s 2015 scores on both government effectiveness and control over corruption are somewhat above both the global median. The country scores better than middle-income Brazil, Colombia, Mexico, Thailand and Turkey. South Africa’s scores are way higher than those of lower-income Kenya and Nigeria. The point is not simply an empirical one. As Nobel prize-winning economist Douglass North and his colleagues have explored in depth, underlying a continuum in the balance between personalised patronage and impersonal rule-of-law institutions is the reality that political, economic and institutional development co-evolve. An initial platform of institutional stability provides a basis for economic and political actors to organise. Their greater strength provides in turn a basis for further strengthening of institutions. Over time, polities and economies become increasingly complex, and are underpinned by increasingly complex (and increasingly impersonal) rules. (so far) the shared commitment across most of the diverse political spectrum to constitutional mechanisms for resolving conflict. The forces that can mobilise in support of rule-boundedness are thus far more powerful than they are in Kenya or Nigeria. In fairness to Cheeseman, it is worth noting that he does identify these differences, though his focus is on similarities between South Africa and other African countries. It is also worth noting that, as I have argued in joint work with Alan Hirsch and Ingrid Woolard, unless South Africa’s extremes of inequality are addressed, the stresses on the country’s institutions will continue to be large. But one has to recognise that there is a continuum between rule-boundedness and patronage. That underscores that on both the economic and political dimensions South Africa potentially has a long way further to fall from its current messy institutional realities. And for a middle-income country such as South Africa, should the forces committed to rule-boundedness lose out entirely, the downside is much deeper than in lower-income countries. Patronage systems are not synonymous with bad governance. Ministers and other high level officials have the capacity to use their appointment power to attract highly qualified staffs to carry out specific policy initiatives … Managers with discretion over hiring have significant opportunities to create islands of excellence. Discretion in hiring can provide means for escaping the rigidity of personnel laws and regulations. Inherent in the flexibility that makes patronage systems available for a variety of goals is the problem of their instability and politicisation considerable potential for unwise use and the undermining of the public purposes of government. The fatal weakness of patronage systems is that they are capricious, not that they are inevitably incompetent. As I have argued elsewhere, “state capture” goes beyond patronage – both in kind, and in consequence. It involves predation without restraint. As theorists of grand corruption sometimes like to put it, “a fish rots from the head down”. Once predatory kleptocracy takes hold, a downward economic and political spiral can unfold rapidly. That is why it is so urgent to call what is happening by its true name. Rule-boundedness and patronage fall along a continuum. Most middle-income countries are located somewhere in the middle. They depend for their functioning not on “good governance” but on complex, “good enough” economic and political institutions. « Seventeen million hostages freed — the moral universe can still bend towards justice!